You are invited to review CAA’s new Strategic Plan 2015–2020, that was approved by the Board of Directors at its May 4, 2014, meeting and will begin in July 2015. The plan is the result of over twelve months of work by the Task Force on the Strategic Plan 2015–2020, chaired by Anne Collins Goodyear, past CAA president, and comprised of members of CAA’s board, committees, and staff, as well as stakeholders in the visual-arts. Results from a comprehensive survey of members about new opportunities and the future direction of the association, as well as one-on-one interviews with twenty-one external colleagues, introduced and refined key issues. In addition, CAA’s Professional Interests, Practices, and Standards Committees and affiliated societies were consulted. A planning retreat was held at the Sterling and Francine Clark Art Institute for board members, Clark fellows, and CAA executive staff. Finally, CAA members had a chance to see and comment on a draft version of the plan at the Annual Members’ Business Meeting in Chicago at the 2014 Annual Conference. In short, I believe this plan reflects the thoughts and ideas of virtually every corner of CAA’s constituency. 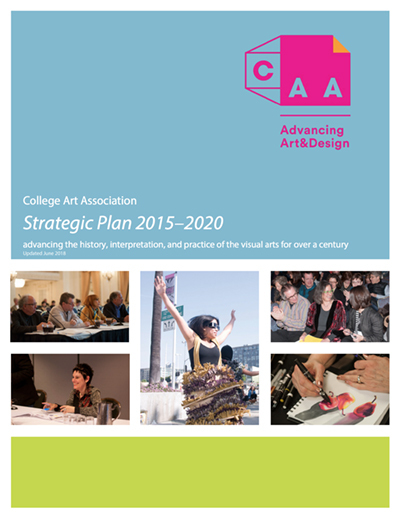 I am confident that the new strategic plan lays the groundwork for CAA to address the critical issues in the visual-arts, including the changing academic workforce, professional development, digital expertise and resources, advocacy, diversity, and social communication. CAA is poised to continue its dynamic leadership in the field, as put forward by the new Strategic Plan 2015–2020. I hope you will review the principal goals and objectives outlined in the plan and join me in celebrating an exciting future for CAA. CAA has made great strides to meet the goals of the Strategic Plan 2010–2015, published in October 2010 under CAA past president Paul B. Jaskot. Many of its key issues, including innovative communication technology, workforce issues, and professional development, will continue to be of focus in the Strategic Plan 2015–2020.